Abstract: Like all heatsinks produced by Zalman, it's intended to operate quietly and efficiently without much noise. The Zalman CNPS9500-series heatsinks come in several different flavours; the illuminated CNPS9500 LED, the flashy chromed CNPS9500 AM2, and the Intel-only CNPS9500 AT heatsink which FrostyTech is evaluating today. Each of these models is made up of about a hundred 0.2mm copper fins attached at regular intervals to three copper heatpipes bent around into a figure-eight form, such that the entire heatsink frames the 92mm spinning fan at its center. 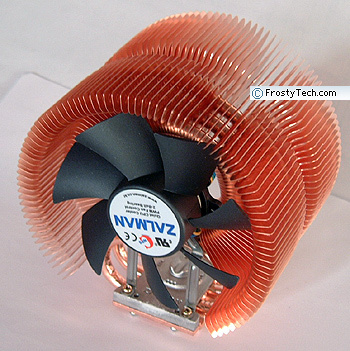 Zalman's CNPS9500 AT is identical in materials and size to previous CNPS9500-series heatsinks, but this heatsink is offered with a 4-pin PWM fan for Intel-based computer systems, rather than the standard 3-pin fan power cable. The heatsink is voluminous in size and weighs about 530grams. Like all heatsinks produced by Zalman, it's intended to operate quietly and efficiently without much noise. Because the Zalman CNPS9500 AT heatsink uses a Pulse Width Modulation fan, no FanMate2 fan speed controller is included with it - it's just not needed. Instead, when the CNPS9500 AT is installed onto a socket 775 motherboard which has a 4-pin CPU fan header, the BIOS will monitor processor temperatures and adjust fan speed from anywhere between an audible 2650RPM, right on through to a virtually silent 1350RPM. If the heatsink is installed onto a socket 775 motherboard that only has a 3-pin CPU fan header, the fan will work, first at its lowest speed and then quickly ramp up and maintain a steady speed of 2650RPM. This diminishes the heatsinks's low noise attributes, as the fan creates about 53 dBA at full speed (according to our real world measurements). Materials: copper base, heatpipes and fins. The complex shape of the Zalman CNPS9500 AT heatsink makes installing it a bit of a challenge. 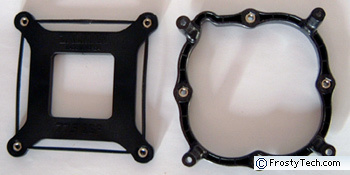 For this, Zalman have come up with a special LGA775 mounting harness which first attaches to the Intel socket 775 motherboard; you'll need to remove the entire board from the case first to install the bracket. 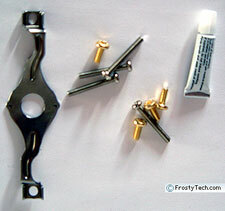 After that is done the heatsink can be installed or removed with just two screws. The manufacturer recommends that the warm exhaust from the Zalman CNPS9500 AT be directed towards the rear of the chassis, so make sure to do that. Also, there shouldn't be any interfering components within 56mm of the center of the CPU (top and bottom directions), and none within 45mm of the center of the CPU towards the front or rear of the case. 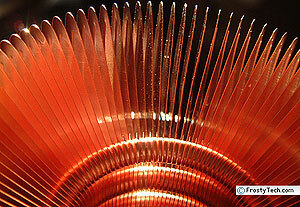 If there are, it may damage them, or bend the soft copper fins of the Zalman CNPS9500 AT heatsink. Since this is a pretty tall cooler, there will need to be at least 135mm space above the CPU socket within the PC case. A few quick measurements will ensure that the power supply, videocard, and any optical disk drives in your computer case are far enough away from the CPU socket for the Zalman CNPS9500 AT heatsink to be installed correctly. The stainless steel mounting clip that holds the CNPS9500 AT heatsink in position will also need to be threaded perpendicularly through the six copper heatpipes so the center hole rests on the aluminum base cap of the heatsink. It is kind of a tricky manoeuvrer, so pay close attention to the illustrations in the manual and take your time. After that, a screwdriver quickly allows you to attach the Zalman CNPS9500 AT heatsink to the socket 775 retention frame, and that's it.